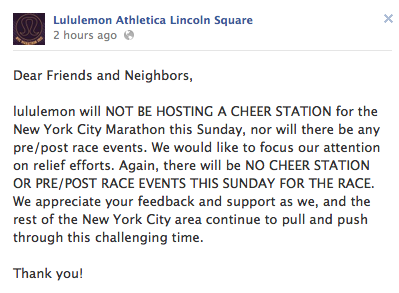 I want to take a minute to acknowledge this gesture that the educators at Lululemon Lincoln Square in New York have made in response to the very controversial decision to continue the New York City Marathon as planned despite the devastation from hurricane Sandy on the citizens of New York. This was the first that ESPN was going to publicize the marathon on TV in several years so there is a lot of sponsorship pressure to continue on the marathon. After the hurricane and devastation, the media attention on this event is also much, much greater. So many petition groups have sprung forward because the majority of people affected that do not have a corporate interest in the money generated by this event are really angry that resources are being used to pull this event off. People in the city are without water, yet this event surely will have pure water for runners to drink. Hospitals are running of generators…yet this event currently has tents already set up that are being powered by generators. Buses will be picking up runners to take them to the starting line (in a hurricane ravaged area), yet ambulances are running low on gas. I know some of you have trained for a very long time for this event and its really unfortunate to have to miss out, its sad, but it certainly is not a devastation to your life. All this to say, I’m so very proud that an athletic apparel company that could very well have decided to pursue marketing based cheer stations and race events are deciding not to do that out of respect for the people that are deeply affected. "New! Take Me With You Tote"